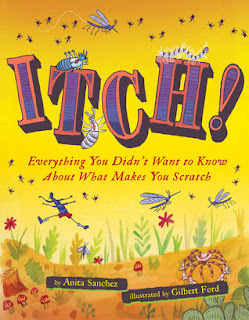 Anita Sanchez explores the question: Why do people itch? in her latest nonfiction picture book. The idea for the book came to Sanchez while she was reading her grandfather's journal. He was a soldier in World War I, and surprisingly he wrote about being itchy and dealing with lice. Itch! 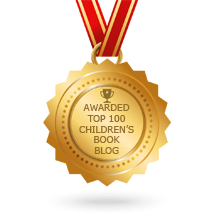 is organized into nine chapters and explores topic such as fleas, plants, mosquitos and bedbugs. Each chapter begins with a narrative related to the topic before switching to an expository style. Sanchez devotes the first chapter to describing the layers of the skin, the purpose of skin and how nerves function before shifting the focus of the book to the organisms (plants, insects, arachnids) that make our skin itch. Sidebars are creatively displayed on bits of notebook paper tacked onto corkboard. Ford's cartoon-style illustrations add a comic element to topics that might make some readers cringe. 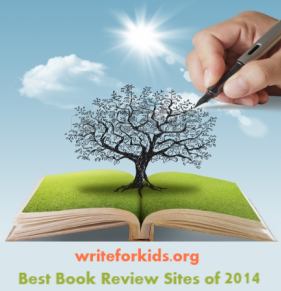 A lengthy bibliography, list of websites, glossary, and author's note are included in the back matter. Itch! is a fact-filled, high-interest, nonfiction book that creatively blends history and science to teach readers about a sometimes irritating topic.